TIBETANS IN EXILE: PASSPORT or RC'S, WHO GETS WHAT? 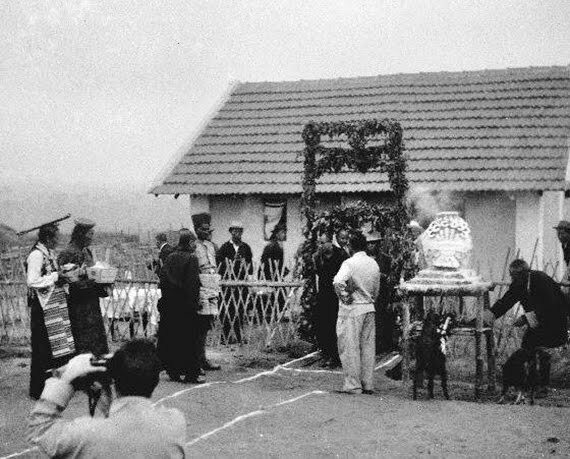 HH the Dalai Lama in Bylakuppe, 1963. His Holiness the Dalai Lama has just completed a successful North American tour, where he was given honorary degrees by several colleges and gave many sold-out public talks. But looming over the celebrations was news from Tibet of more self immolations in Kham and Amdo confirmed by Radio Free Asia and VOA, bringing the number to 60 or more. This month also marks the 50th anniversary of the 1962 India-China War. Combat was brief and casualties were few: fighting began on October 10th 1962 and came to an end on November 21st. The death toll for soldiers was an estimated 1,460 Chinese, 3,128 for India. Yet the consequences of this anxious month of skirmishes in Arunachal Pradesh and Ladakh were enormous. It handed Mao a stunning victory and dealt Nehru an equally stunning defeat. It destroyed Nehru’s vision of pan-Asian unity in a post World War II world, accelerated the militarization of Himalayas and greatly advanced Mao’s hegemonic ambitions across the continent by sealing China’s control over Tibet. It may have been a short war, but it was not a minor one. The CTA has put forth this argument for years, but at this late date, many in Tibet have lost hope and have only a symbolic connection to the exile world. For others in Tibet whose hope remains strong, this faith is not sustained by the fact that most Tibetans in India remain adrift in statelessness, and many who managed to go West have taken Western citizenship. The presumed function of giving “hope for Tibetans in Tibet” is not a logical justification for depriving tens of thousands of Tibetan families of the security and benefits of citizenship in India, the country that has done the most for Tibet, and has the greatest stake in the fate of Tibet, as it honors the fallen of the ‘62 China War. What is painfully obvious to those scattered across India, is that lingering in the deteriorating settlement system created in the early 1960’s, with nothing but an RC, is increasingly untenable. The largest Tibetan settlements in South Asia are in Karnataka State, four sites on land leased by the Indian government since the early 1960’s. In 1996 I visited Bylakuppe, and noted the peaceable relations between Tibetans and their Indian hosts and neighbors. But in recent years as population and urbanization have exploded, there has been an increase in conflicts between young Indians and Tibetans in Karnataka; the Indian press has documented attacks on monasteries and a new wave of murders of young Tibetan men in Bylakuppe, Kollegal and Hunsur. A great many of the senior leaders in the CTA have foreign citizenship, and given the legal and economic restrictions that govern Tibetans who remain in India with only an RC, it is perfectly logical that anyone with the chance to immigrate will do so. Lodi Gyari, for many years chief envoy of HH the Dalai Lama, and a long-time leader of The Bridge Fund and the International Campaign for Tibet, was recently honored with a US Congressional Resolution, which stated that he is “a naturalized United States citizen.” My father, Senator Daniel Patrick Moynihan, helped the Gyari family immigrate to the United States, and assisted many other Tibetan friends and colleagues with citizenship procedures during his 24 years representing New York in the US Senate. The other senior envoy of HH the Dalai Lama, Kelsang Gyaltsen, is a Swiss citizen. In the present CTA, at least three Kalons have foreign citizenship; Dicki Chhoyang (Int. Relations) is Canadian, Pema Chhinjor (Religion and Culture) is American, Dolma Gyari (Home) is Indian. Citizenship confers security, and security is what their stateless constituents sorely need. But many Tibetans in India report that the CTA actively discourages or impedes efforts to obtain Indian citizenship in many ways, including reportedly depriving candidates of the ability to receive NORI (No Objection to Return to India) permits. Mr. Lobsang Sangay, who recently persuaded the Tibetan Parliament-in-exile to change his title from Kalon Tripa to Syikong, has inspired many Tibetans with his story of rising from a poor childhood in West Bengal to Harvard Law School. While campaigning, Mr. Sangay publicly stated that he had chosen not to obtain US citizenship, and after fifteen years of living in the USA, he still kept his RC. His campaign website stated that, after fifteen years, he “would have been a citizen by now. But he decided to carry an IC [Indian Identity Certificate], knowing well enough that one day duty might call him back, to serve his fellow countrymen.” Mr. Sangay also implied that his opponent, Tenzin Tethong, had not been true to the exile identity and struggle because he had obtained US citizenship for himself and his family. It is unclear whether or not Mr. Sangay actually has a US passport or green card, or has in fact lived and worked in the US for over a decade and a half, traveled extensively, and obtained a bank mortgage with only an Indian RC. What is clear is that he has established a secure financial base in the USA, where his family has immigrated. After completing his S.J.D. degree at Harvard Law School, Mr. Sangay worked at Harvard as a Research Fellow whose salary and expenses were paid out of a $100,000 per year grant from the Hao Ran Foundation of Taiwan. In 2007, Mr. Sangay applied for (and received) an O1 Visa for “aliens of exceptional ability”; the key feature of this visa is that it allows individuals to then immediately apply for a Green Card, and then U.S. citizenship within three years. Like many Fulbright students and CTA officials, Mr. Sangay has been able to acquire property for his family in the U.S. Public records confirm that Mr. Sangay purchased a two-unit home in Medford, Mass. on August 7, 2007, and paid off the mortgage in full on July 29, 2011. (A different version of this article, at Rangzen.net, explores this issue more.) Thus Mr. Sangay has an O1 US visa, and a mortgage-free home Massachusetts, so he has established a secure base in the US, and is on track to become a US citizen, if he has not already done so. Certainly no one begrudges him his success; most Tibetans stranded in India and Nepal would do the same, if they had the chance. In modern democracies, candidates for public office must by law disclose their assets. HH the Dalai Lama purposefully established a democracy in exile, thus full disclosure of assets and properties is in full accordance with standard legal procedures in all democratic governments. Mr. Lodi Gyari, Mr. Tenzin Tethong, Ms. Dicki Chhoyang and other senior leaders have been fully candid about their citizenship status. Mr. Sangay can take leadership on the critical issue of citizenship, by clarifying his residency status in the US, and helping his constituents secure their own financial assets and pathways to immigration. Who gets passports, who gets RC’s? The CTA must make a stronger case for keeping thousands of people shackled to an RC other than not making those in Tibet “lose hope” especially when senior leaders have already secured assets and/or citizenship in the west. All surveys, including the CTA’s 2010 demographic report, confirm that the vast majority of Tibetans in India and Nepal live at the poverty line, and despite education and training given by the Indian government, NGOs and foundations, the restrictions imposed by the RC status thwarts mobility and opportunity, trapping them in a downward cycle. And without the protection of citizenship, stateless Tibetans are especially vulnerable to corruption and coercion. For more on Bylakuppe, see this article from the Tibetan Political Review. Mr. Sangay must explain why his administration believes that over 100,000 Tibetans in India must remain as refugees (when they are technically only classified as foreigners), when his family has a well-established base in the US, where he can return at any time, possibly with an undisclosed green card or U.S. passport, enjoying the dream of thousands of Tibetan families scattered across in the Indian subcontinent. Repeating the mantra that Tibetans in Tibet will lose hope should their kinfolk in India relinquish refugee status is illogical and impractical at this time of crisis. Tibetans in exile are beginning to lose hope too, hope for security and prosperity, hope that they will ever be citizens of anything. On a recent trip to Pokhara, I met a Khampa elder in Jampaling, one of the four old settlements in Pokhara, once prosperous, now forlorn. He sat on a stool, spinning an antique prayer wheel, gazing sadly upon a desolate field that was once a thriving carpet factory, and spoke: “I am tired of being a refugee. I have lived here for 50 years and my hope of ever seeing Tibet again is gone. All the children want to leave this place, they want to go to India or America. Why should they stay here, where there is no future?